German pianist and composer; born at Hamburg Aug. 21, 1829. He studied under Jacob Schmidt and F. W. Grund; with Hans von Bülow under Mendelssohn at the Leipsic Conservatorium; and in 1848 under Chopin in Paris. In 1849 he played at a concert given in London by Jenny Lind; in 1851 he accompanied her on a tour through America; and on Feb. 5, 1852, was married to her at Boston. 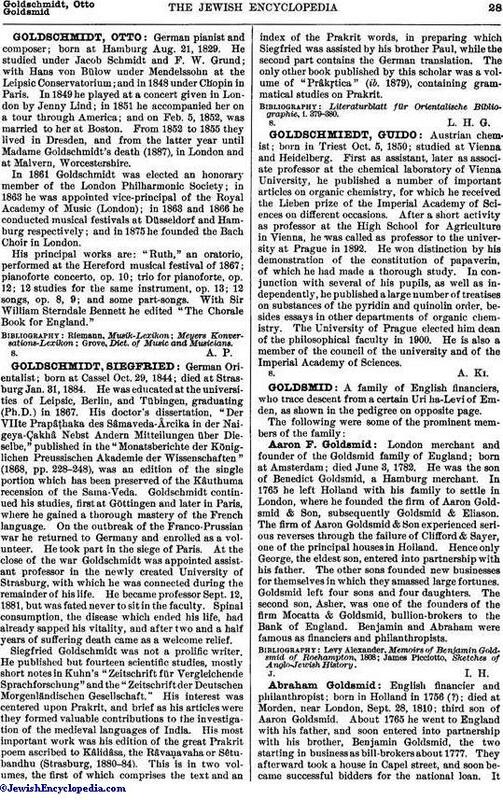 From 1852 to 1855 they lived in Dresden, and from the latter year until Madame Goldschmidt's death (1887), in London and at Malvern, Worcestershire. In 1861 Goldschmidt was elected an honorary member of the London Philharmonic Society; in 1863 he was appointed vice-principal of the Royal Academy of Music (London); in 1863 and 1866 he conducted musical festivals at Düsseldorf and Hamburg respectively; and in 1875 he founded the Bach Choir in London. His principal works are: "Ruth," an oratorio, performed at the Hereford musical festival of 1867; pianoforte concerto, op. 10; trio for pianoforte, op. 12; 12 studies for the same instrument, op. 13; 12 songs, op. 8, 9; and some part-songs. With Sir William Sterndale Bennett he edited "The Chorale Book for England." Grove, Dict. of Music and Musicians.